Are Democrats Losing the First Amendment? If Democrats aren’t careful they risk surrendering a core American value to conservatives. I don’t usually write about partisan politics, because if I did I would never stop, but in this case it deals with the First Amendment. By way of background, it seems that liberals lost the use of the American flag as conservatives appropriated it as their own. This, no doubt, began in the 1960s when antiwar protesters started burning it. Liberals have struggled to recover. Stephen Colbert built an entire satiric show around the concept that waving the flag somehow meant that you were patriotic — while ignoring the values that the flag stands for. We may now be seeing yet another version with a battle over the First Amendment. The New York Times decided, in a fit of epic stupidity, to highlight that right wing nut job conspiracy theory propagator Alex Jones hired noted First Amendment attorneys Marc Randazza and Jay Wolman to defend him in a defamation suit from the parents of Sandy Hook massacre victims. Crackpot Jones claimed the massacre was a hoax. This is what we lawyers like to call in legalese, logical. Because if you have a First Amendment problem you’re not going to hire a matrimonial or real estate attorney. When I was sued for defamation the first time, in the infamous Rakofsky case, I was part of a large group of lawyers who hired Randazza. There was a damn good reason for it. But no, the Times decided to highlight the fact that Randazza also represents a Nazi in one of his other First Amendment defenses. Note to the Times, which should know better: If you’re going to represent free speech issues you are not likely to be representing the late Mr. Rogers and his neighborhood. You will sometimes defend people out on the fringes of society, many of whom are widely detested. Benign language that the majority loves isn’t where free speech battles are fought. This article was a follow-up to an Adam Liptak article in the Times about the First Amendment being “weaponized” by the right. Lets be clear: The First Amendment is not an issue of the left or the right, as all people benefit from its protections. Those who defend the First Amendment firmly believe that an infringement upon it is an infringement upon everybody’s rights, regardless of whether you come from the left or the right. Lawyers that defend free speech are not really defending the speaker. They’re defending the constitution. This is not to say that the Democrats are the only fools in this battle over American symbols. The Republicans, for example, have lost the Statue of Liberty as they elevate bigotry over the statue’s central message. Why it is that Democrats have not created a flag with the torch of liberty to constantly wave remains a mystery to me. This will haunt the GOP for decades to come. That issue was a gift to Democrats, just as surely as the burning of American flags was an inadvertent gift to Republicans. And so, dear New York Times, don’t be so quick to make the First Amendment a battleground of partisanship, the way it has for the flag, anthem and statue. It will not end well for those who believe in free speech. And that doesn’t just mean not ending well for you as a major media outlet, but for all Americans. What the heck is going on up there in Albany? 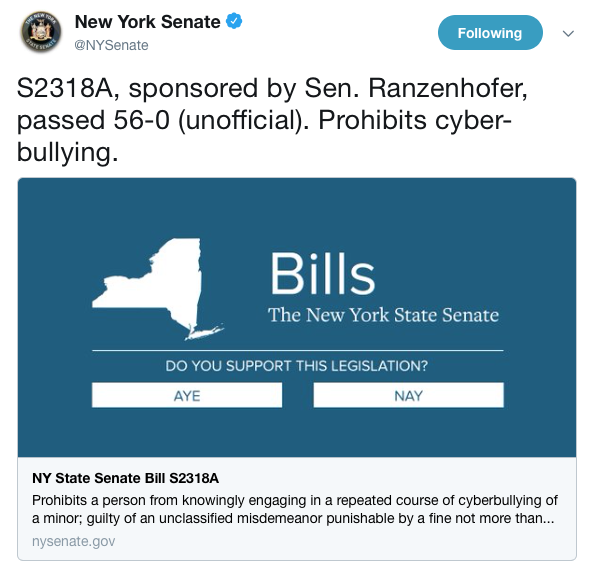 Last week you passed an anti-cyberbullying bill that restricts free speech and conduct in such a way that, if ultimately signed, is guaranteed to be tossed into the trash heap by courts because it violates the First Amendment. And this week you do it again?! 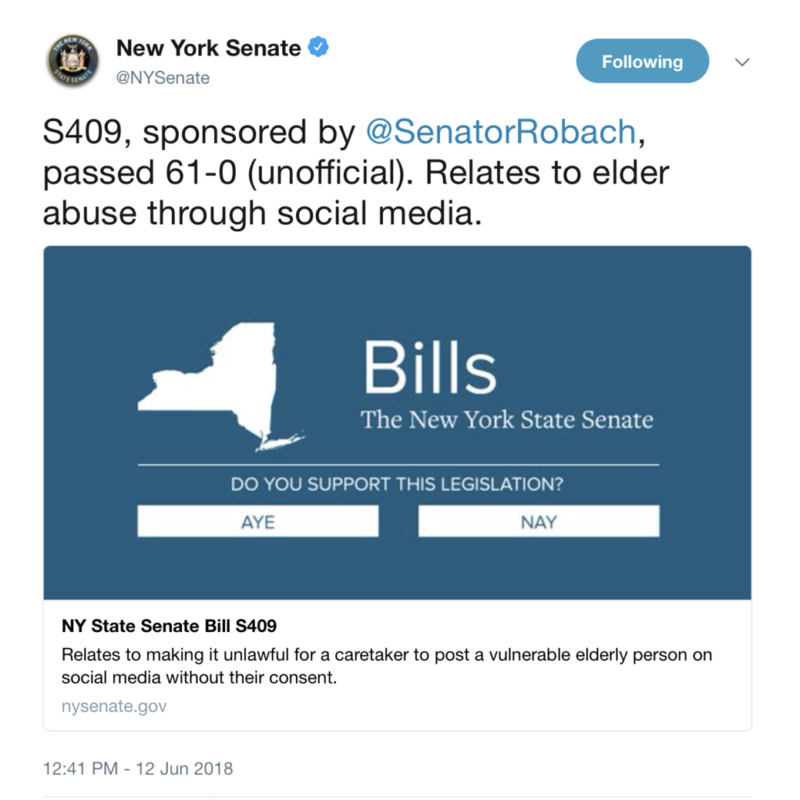 This time with your Elder Abuse Bill (S.409) that makes it a crime for caregivers (including family) to post photos on social media if elderly, vulnerable seniors aren’t able to give consent. 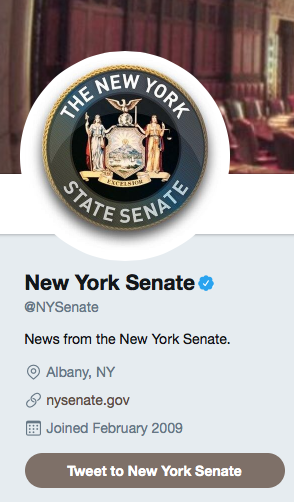 Now I understand it might have made you feel good to pass such a bill, and you get to boast to constituents that you are doing something in Albany, but do you realize what you have really done? A PERSON IS GUILTY OF UNLAWFUL POSTING OF A VULNERABLE ELDERLY PERSON ON SOCIAL MEDIA WHEN, BEING A CAREGIVER WHILE PERFORMING THEIR DUTY OF CARE FOR A VULNERABLE ELDERLY PERSON, HE OR SHE POSTS AN IMAGE OR VIDEO OF SUCH PERSON ON SOCIAL MEDIA INCLUDING, BUT NOT LIMITED TO FACEBOOK, YOUTUBE, TWITTER, INSTAGRAM, SNAPCHAT, TUMBLR, FLICKR AND VINE, WITHOUT SUCH PERSON’S CONSENT. First off, while the First Amendment says that Congress “shall make no law…abridging the freedom of speech,” and the amendment applies to the states, there are still some very limited exceptions to it. But this just isn’t one of them. 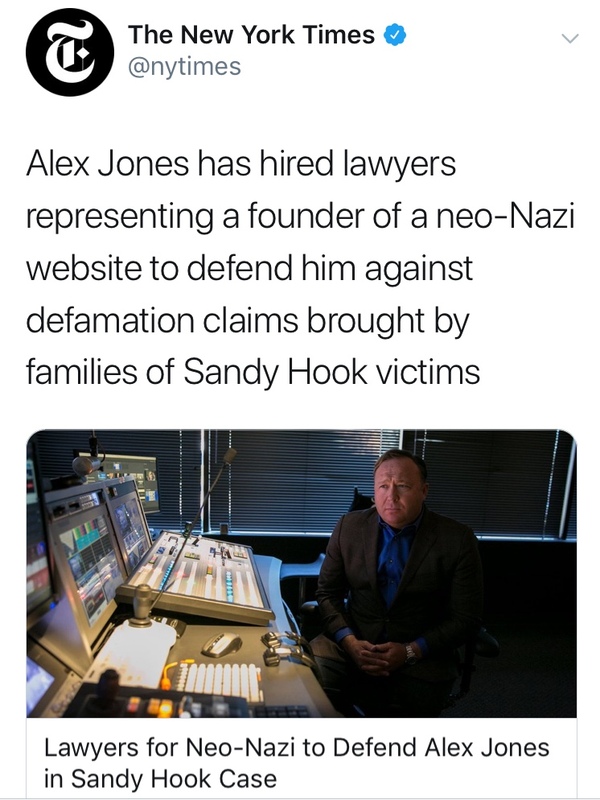 The First Amendment is no defense to conspiracy discussions about committing a crime, or defamation, or inciting imminent lawless action, or obscenity or copyright. I don’t see posting pictures of elderly Ma or Pa on that list. For this bill, if signed, to pass constitutional muster, the Supreme Court would have to create a wholly new category of restricted speech. Do you think they will do that? Or more importantly, did you even analyze that? My guess is no since this bill passed 61-0, and there are more than a few lawyers in the Senate. So, let’s say, on disabled Ma’s birthday you (a caregiver) hold a party for her, even though she can only semi-appreciate it. Then you share those party photos on Facebook for your friends and non-attending family members. Guilty of a misdemeanor. So let’s say that on Veteran’s Day you share a photo of your disabled WW II father for whom you sometimes care. He’s 20 years old in that long-ago-taken pic and in uniform. You are proud of his service (as was he) as part of the Greatest Generation. Guilty of a misdemeanor. And the same is true for sharing any other photo for such people taken during their lifetimes: From childhood, parties, weddings (including their own), vacations, anything you can think of. Since New York has about 20 million people, do you appreciate the scale of how many misdemeanors are being created for sharing a photo of a disable loved one? Even if the Supreme Court did create a new category of restricted speech for this, the bill is both vague and over broad. If this was a new category of restricted speech — you can’t post photos of incapacitated people without their consent — then the slippery slope also says it is OK to criminalize the posting of photos of other incapacitated people. Like kids. How many kid pictures are shared on social media? How big is this problem that you think it justifies a change in the First Amendment that affects millions of people sharing loving photos of their elderly parents?